This weekend I took a trip to Stillwater, Oklahoma to see friends and family. It was a great way to spend a birthday weekend and catch up with people I have not seen since May. On the trip back I opted for the less traveled state highways and saw some beautiful farm and ranch land. The scenery went from farmers preparing fields for this year’s wheat planting to the rough and rugged ranch land of the Northeast Panhandle. This time you’ll have to blame me for not taking my camera, but there are still some great photos out there to enjoy. How often do you drive by a scene like this and not take time to admire the land that farmers and ranchers work so hard to take care of on a daily basis? Now this is a sight that might just catch your attention. 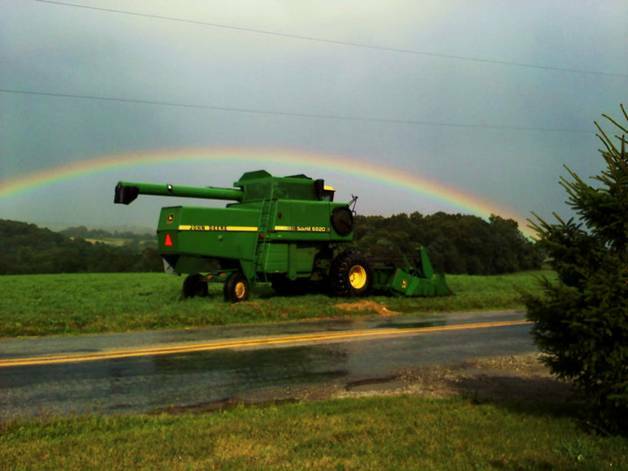 Dolores Krick caught this photo on her family's farm in York County, PA where they raise horses, corn, soybeans, and hay. Where ever the road may take you, take the opportunity to admire the landscape around you. The farmers and ranchers may not be seen as you pass by, but I guarantee you there is some hard work in caring for all of this great land we still have today. View many more great photos of farm and ranch land and meet the people who take care of that land on the I am Agriculture Proud Facebook group. Previous In It for the Win or Experience? Fantastic photos, thanks for putting them up. I’ve been appreciating your posts very much. There is something about how the care of land can enhance its beauty–I speak from experience even if “my” land is about the size of a front porch (considered “big” in Brooklyn)! Gorgeous photos! There is nothing quite as beautiful as farm country!